Beloved and I celebrated my birthday at The Alley about a month ago. It has been tradition for us to eat at a buffet restaurant each year that offers a free seat on one’s birthday with one paying adult, just like we did at Four Seasons on Beloved’s birthday this year. The Alley is from the same Vikings group of restaurants that basically allows you to “eat like a viking”. The twist on this place after the cut. Because my birthday fell on a Monday, we didn’t reserve beforehand thinking there won’t be a queue. We went early anyway, just in case. We were surprised to learn that we weren’t the first ones there, but, as expected, the volume of people wasn’t as many as the usual Vikings queue. We were seated beneath an artificial (?) tree inside the restaurant which had a couch and tables in its periphery. It seems the couples are directed here and we were seated alongside other couples. The Alley is relatively small. Aside from its aesthetics, its concept is also different in that it’s presented like a food court or food park with multiple food stalls. These stalls even have their own names as if they were competing concessionaires. You don’t have to pay, of course, and you just order and get what you want from them. A lot of the Vikings mainstays are present. 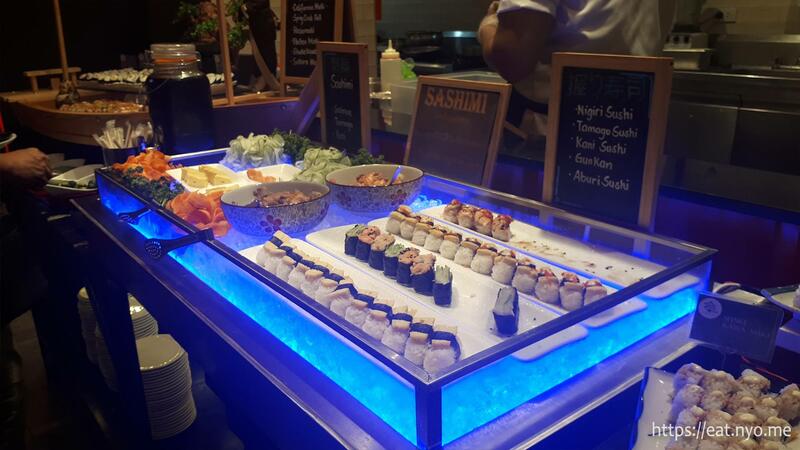 There’s a Japanese section where you can get the usual salmon sashimi along with various sushi and maki. Of course, there’s also other Japanese dishes like tempura and katsu. 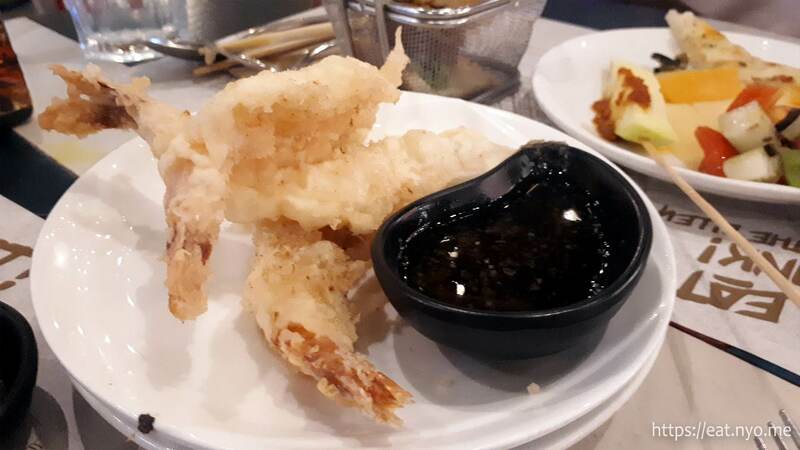 The ebi tempura is a bit unique here in that it’s not served in the open, rather you ask for a plate of it from the concessionaire. 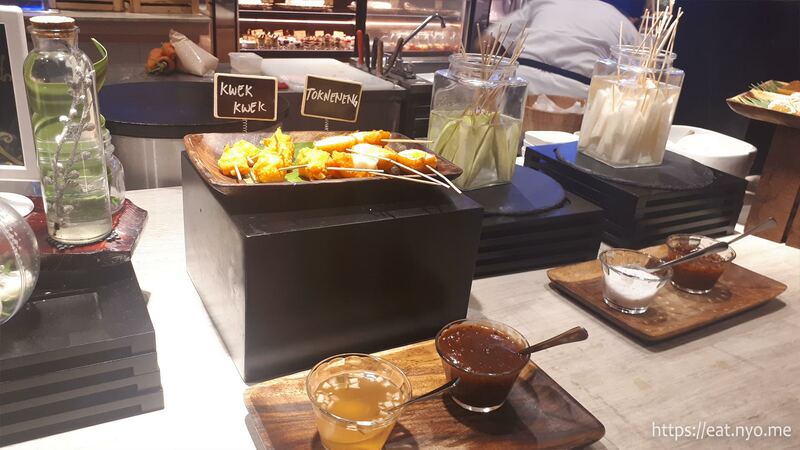 Other mainstays include their salads, appetizers, breads and cheeses, and food from various cultures. 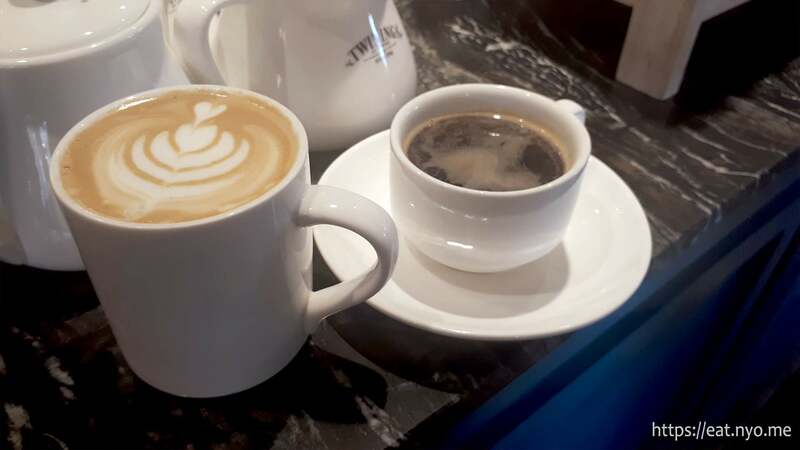 They also have the usual drinks, including coffee and beer, and, of course, a lot of desserts. Again, the difference is that instead of stations, they are isolated in different stalls acting as their own concessionaire. What’s unique in The Alley is their street food. 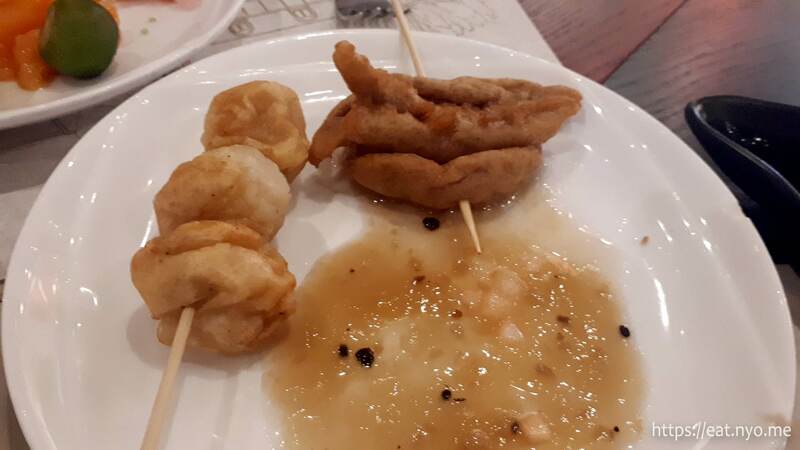 I think this is the only Vikings buffet that proudly offers food like kwek kwek, fish balls, taho, and even dirty ice cream albeit much fancier. 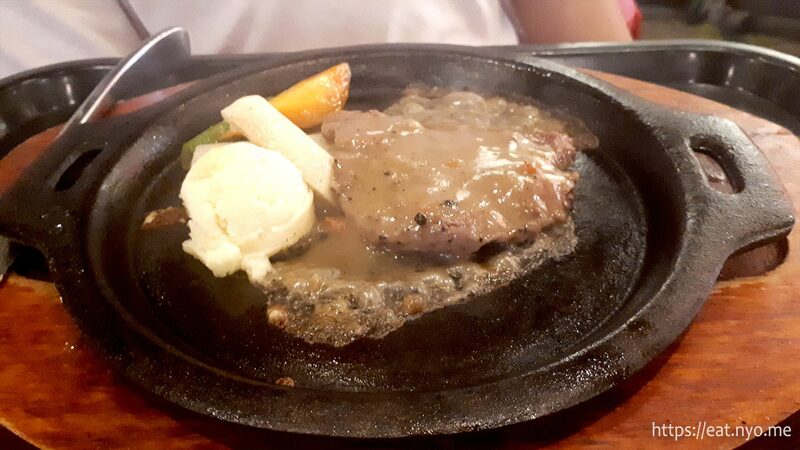 They also changed their usual carving station a bit in that instead of serving steaks, they serve it sizzling just like you’ll find in Pinoy food courts. Also, their usual lechon is replaced with bagnet. 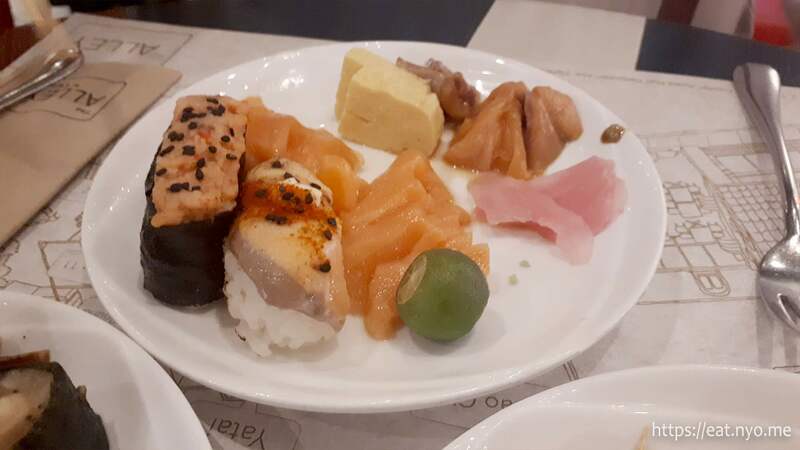 Anyway, I started with their sashimi and some of their sushi, which is my usual start. The sushi rice seems to have been prepared quite early and was a bit cold. Nevertheless, the rest of the food’s quality was similar to what we’ve had in other Vikings restos before. 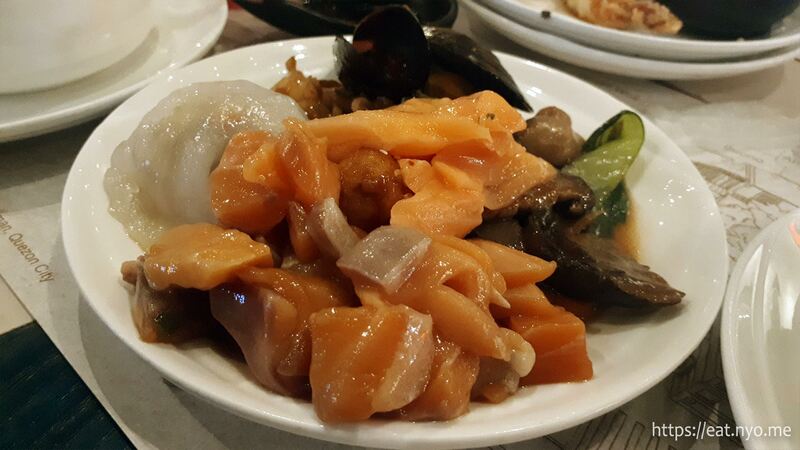 We actually prefer the marinated salmon over the usual sashimi. Beloved started with sashimi as well, but also got some bok choy with mushrooms and some dimsum from the Chinese stall. She also got clams from one of the places. 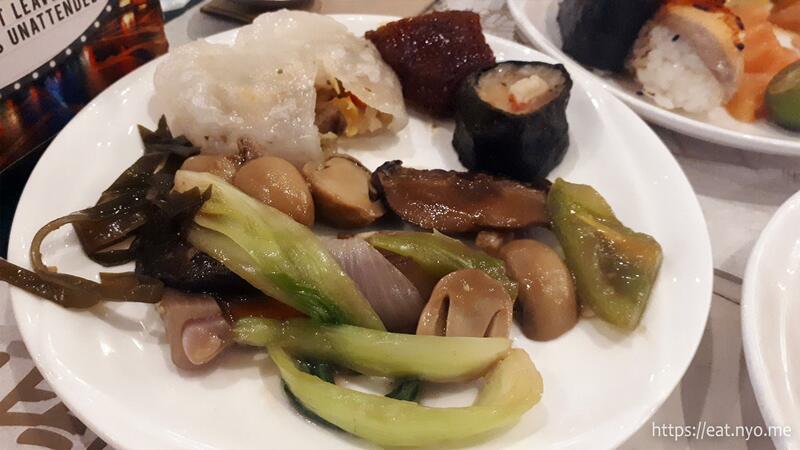 My next plate consisted of the same bok choy with mushrooms dish as well as some dimsum. They were okay, but nothing too special. Discontent with her first plate of appetizers, Beloved went back for more. It’s not a problem, of course, in this kind of place. 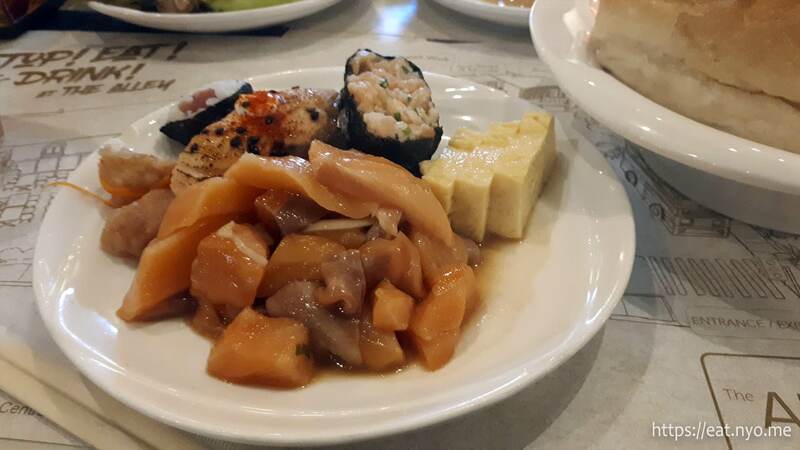 She doubled-down on the sashimi and took some sushi and tamagoyaki as well. As for me, I started trying some of the more unique stuff here. I began by sampling their squid balls and kikiam with the sauce. While good, they sadly don’t have that good “dirty” feel from what you get from the streets. 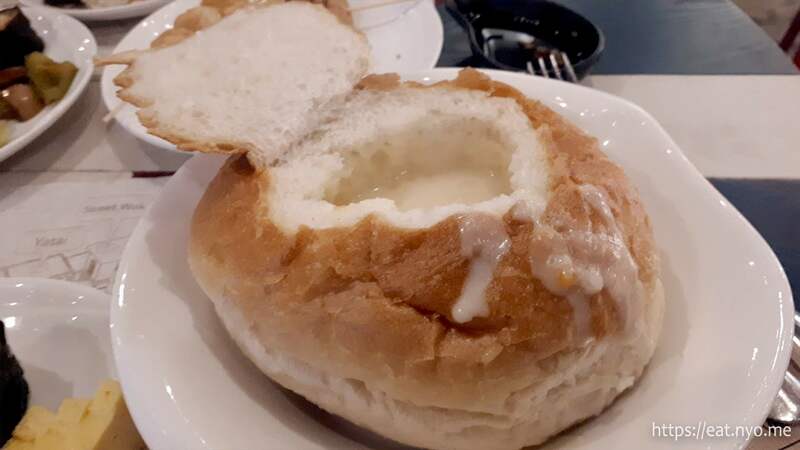 Beloved got their seafood chowder which was served in a hallowed-out bread bowl. It’s actually quite plenty, especially if you eat the bread. You don’t have to eat the bread, though; however, it might feel quite wasteful of food. 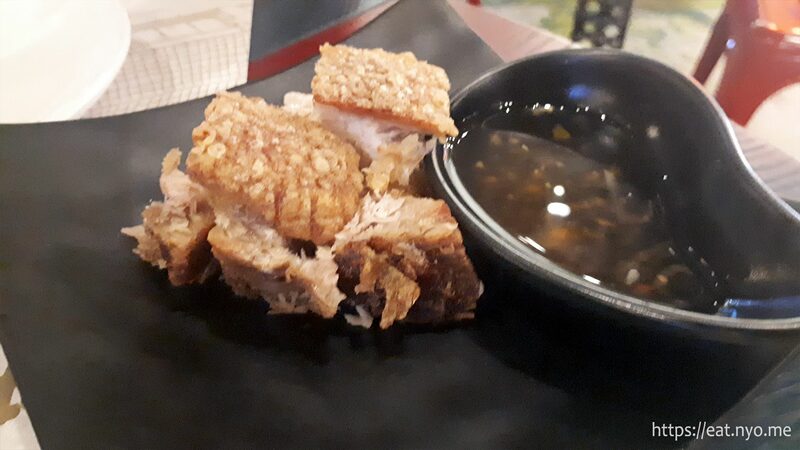 I then got their bagnet, or deep-fried crispy pork belly. This fatty-crispy pork immediately became my favorite dish. 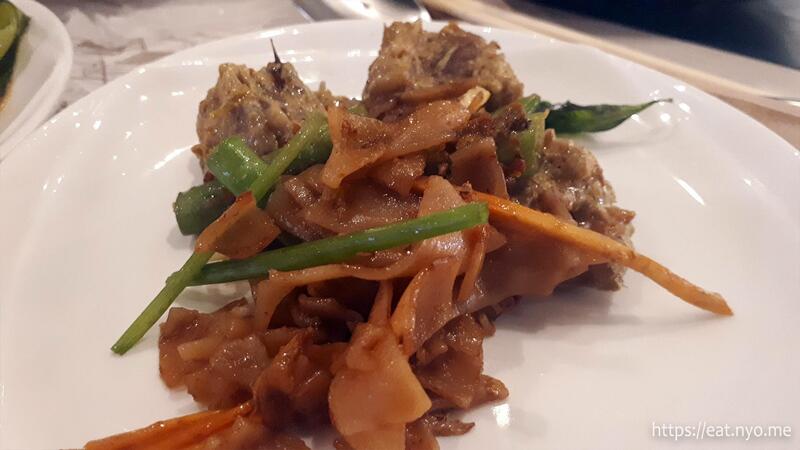 While you can have it in various versions, such as kare kare or in peanut sauce, or sinigang, I had the “classic” version with just vinegared soy sauce. I like that even the meaty part was quite tender and succulent. 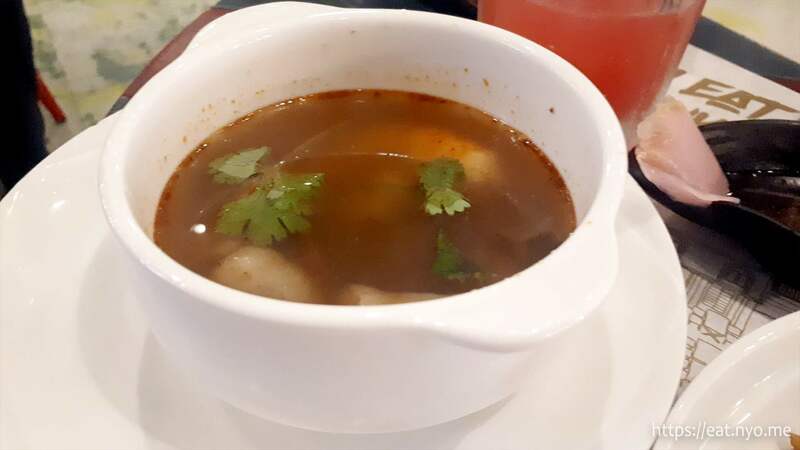 As for Beloved, even though she got chowder, she still got a bowl of tom yum goong, or hot and sour Thai soup. She enjoyed it, but the floating cilantro immediately turned me off this dish. She also got some pad thai and beef rendang. The beef was actually quite good. A bit on the spicy side, the nice tender texture was definitely the highlight of the dish. 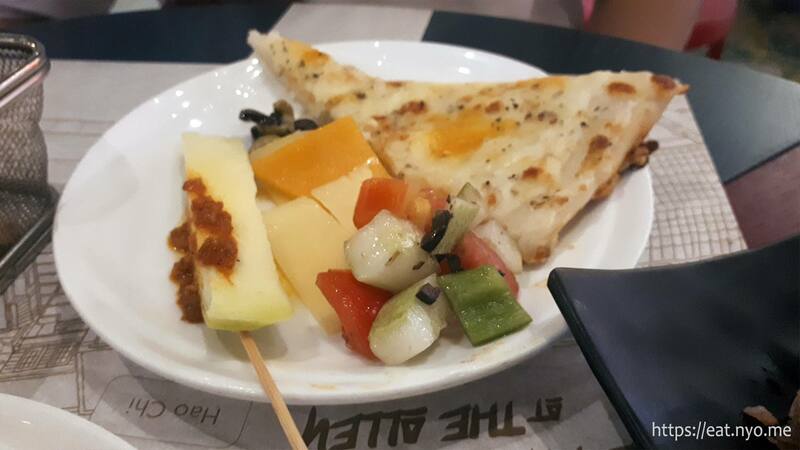 My next sampling consisted of a piece of their green mangoes with bagoong or shrimp paste, some cheeses, a greek-style salad, and a slice of pizza. The pizza wasn’t as good, but the rest of the plate, although very incompatible together, was quite good each on their own. I especially like the not too sour, but sour enough green mango. 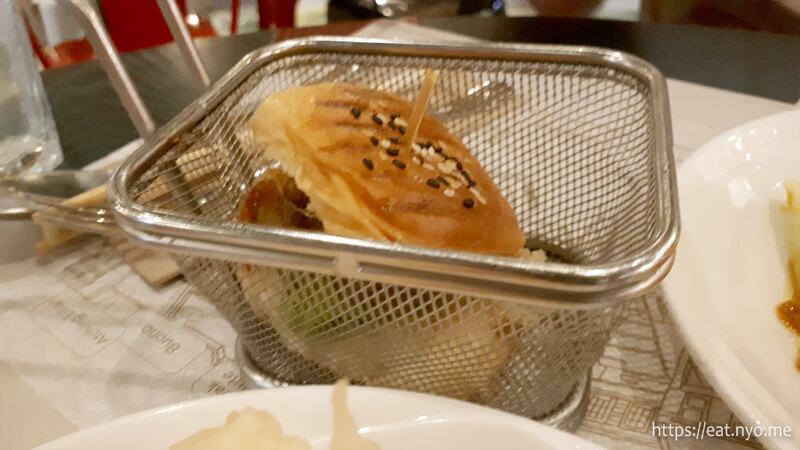 I also got one of their burgers, which is actually more a slider. It was fun presentation-wise, but I wished there was more meat in this. And just to jump around different cultural food varieties, I ordered a plate of their shrimp tempura. As I mentioned earlier, this was served in an individual plate. I wish this becomes a trend so that there’s no ebi tempura hoggers present in buffets like this anymore. I then ordered some of their “dirty” ice cream. I forwent getting it on a cone because I wanted to sample all three flavors. The only “dirty” about this is the presentation, served in the usual street cart. Otherwise, the quality of ice cream here is quite thick, delicious, and what you’ll get from their desserts bar. 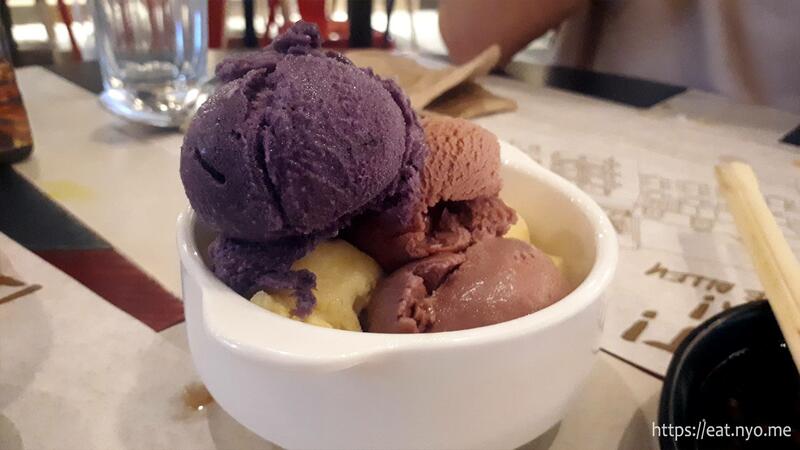 The flavors are the “dirty” ice cream trifecta—ube or purple yam, tsokolate or chocolate, and mango. 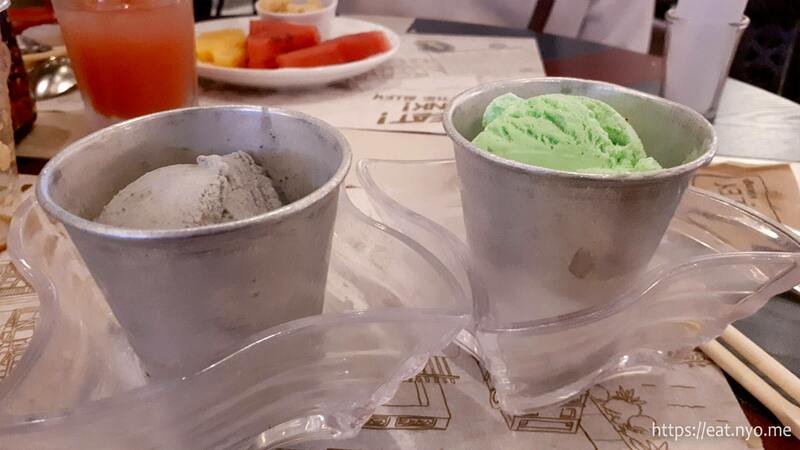 Beloved got jealous of my order and noticed that their non-“dirty” ice cream was served peculiarly. 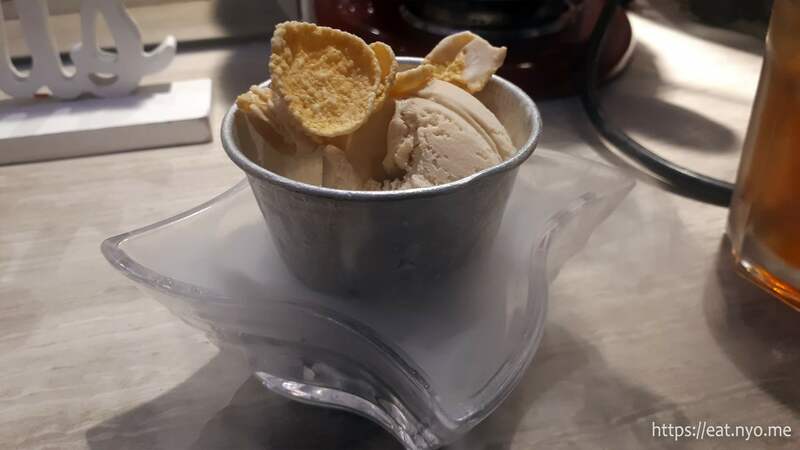 She got their salted caramel ice cream which was served on a smoking bowl of dry ice. Taste-wise is the same and the gimmick was entirely for show, didn’t add anything to the flavor of the dish. I then went for their steak. I got their tenderloin which was served on a sizzling plate. I didn’t like that it has mashed potatoes that I could’ve gone without, and you can’t get your steak without it. I didn’t want to be wasteful so I ate it anyway. It was okay, but I’ve had better steaks elsewhere. 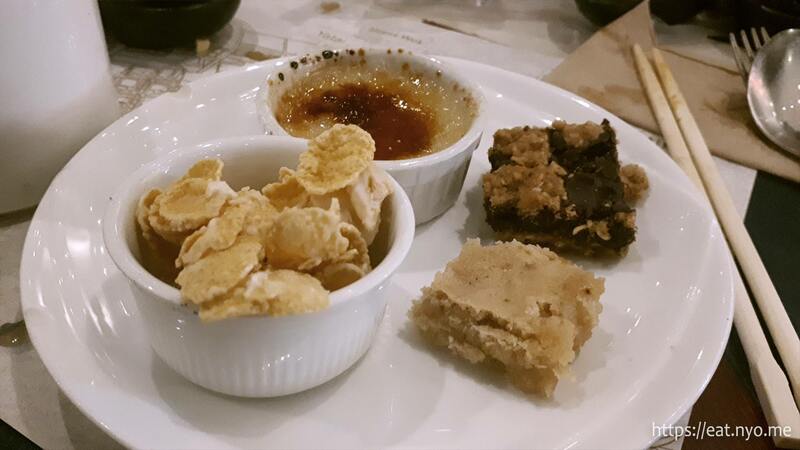 Beloved continued with her desserts, sampling their brownies and creme brulee. She also got a bowl of their cornflakes. 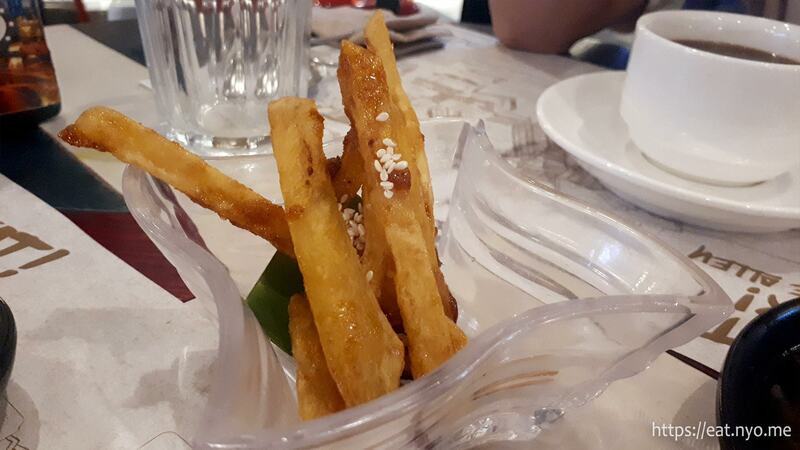 I tried their kamote or sweet potato fries. It wasn’t too sweet, which was good, but it was a bit hefty. Shame, as I was starting to get full at this point. I was urged by Beloved to try their other flavor ice creams, namely their black sesame and pistachio ice cream. The black sesame didn’t really taste anything special, it’s more like a slightly nutty vanilla. The pistachio, on the other hand, definitely tasted pistachio. 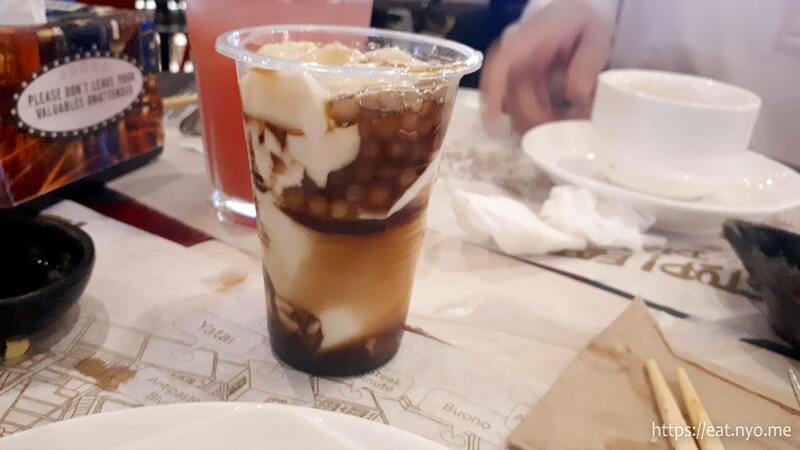 I mentioned there’s taho here, right? This is basically tofu in liquid form with arnibal or a sugary syrup and some sago or tapioca pearls. Sadly, similar to the ice cream, the silken tofu they used in this dish felt a bit too classy, having a much lighter texture and innate sweetness. It’s good, yeah, but might not have a nostalgic feeling having this cup. As we were starting to get full, we ordered a couple of cups of coffee. 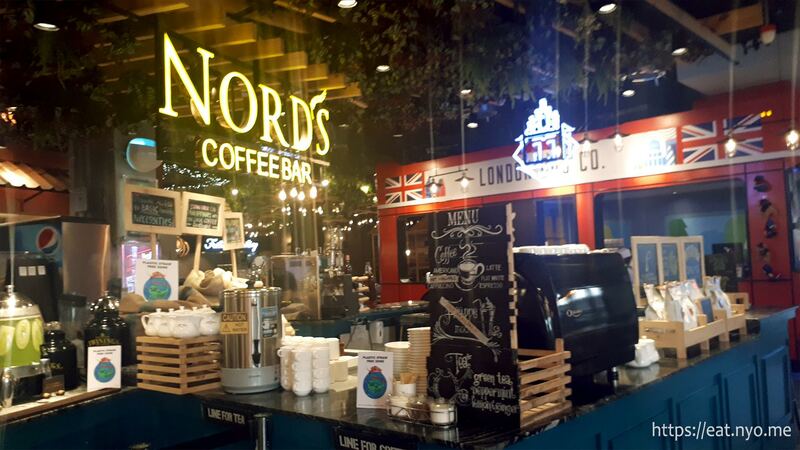 They serve quite a variety of espresso-based drinks as well as teas. Beloved got her favorite mocha and I got an americano. I also got another bagnet for my penultimate plate. It’s a rarity for me to have as much bagnet as I want, so I took advantage of it. 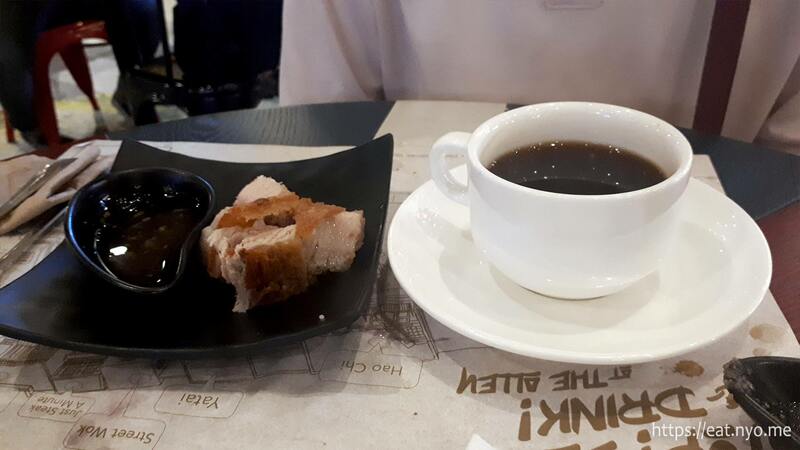 This is also one of the few places you can have coffee with bagnet together and nobody will bat an eye. Well, at least I thought that would’ve been my penultimate plate. They began serving the birthday “cake”, as per tradition of any Vikings restaurant. 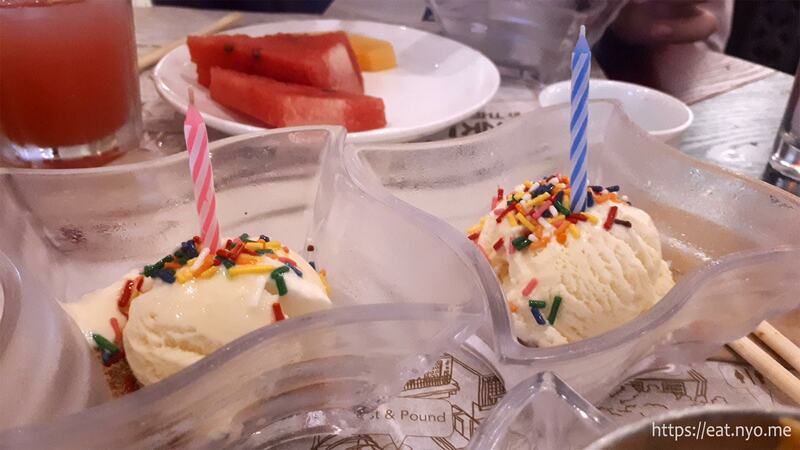 However, instead of cake, here they served the same above-average quality ice cream they serve in their dessert stall. Although this is already my ninth or tenth scoop, my ice cream stomach still had enough space for it. 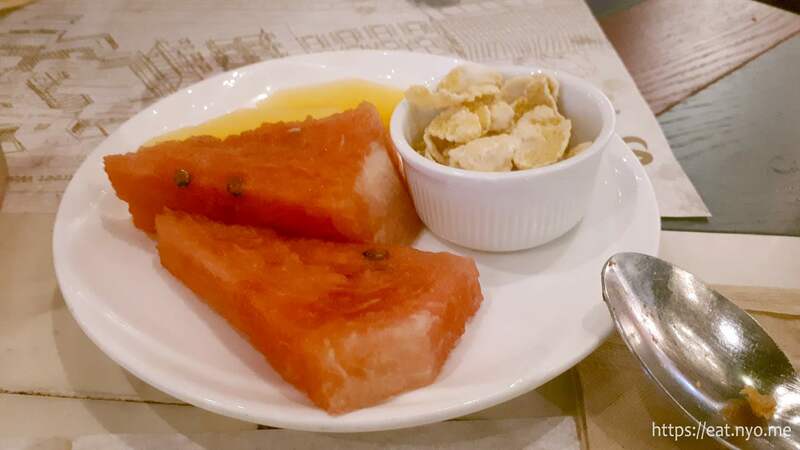 We concluded our meals with a couple of slices of watermelon for me and the cornflakes for Beloved. Mine needed a bit of salt, but Beloved loved her choice for some reason. Looking back, we actually managed to sample everything that we want. It wasn’t an exhaustive list, but we definitely managed to try all that we wanted to try, with emphasis on the street foods. And honestly, it’s not really a “wow, amazing” experience. The twists here were mostly cosmetic in nature and the food was just okay, nothing extraordinary. Overall, it’s an average buffet with above-average ice cream and a relatively fair price. However, if you take advantage of their birthday promo which requires one person to be a birthday celebrant with one paying adult, it becomes a steal. We only paid around 720 Php for the entire feast (688 Php plus service charge). I noticed a lot of other couples had the same plan as we did. And no, you don’t to have a romantic partner—some of them seemed to be friends or classmates and were of the same gender; well, at least, it seemed like some of them were not in a romantic relationship. 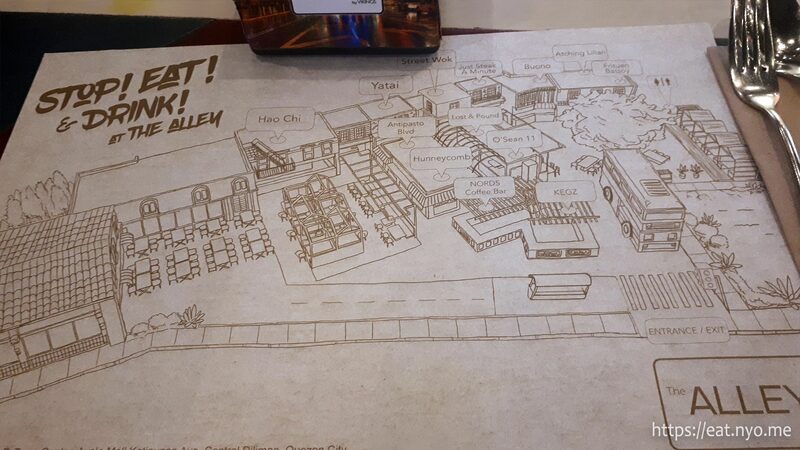 Ahem… anyway, if it’s your birthday and you want something a bit different from the usual Vikings buffet experience, or if you prefer bagnet over lechon, The Alley is a place to consider. Recommended for: Hungry couples in the area with one birthday celebrant. Not recommended for: Non-starving plebs. Smart nomnomnom tip: Have a lunch date here on your birthday.